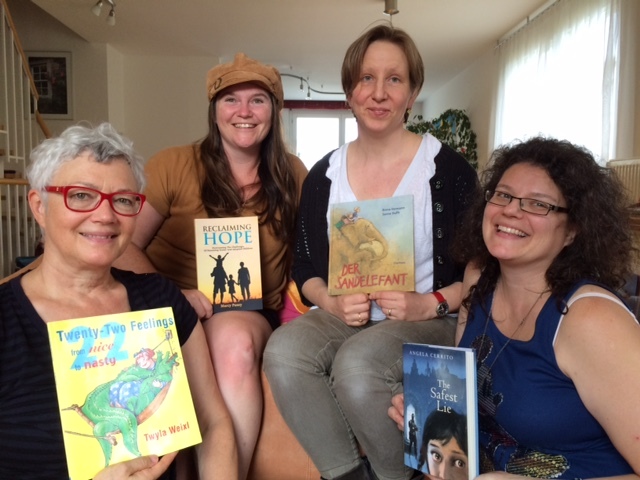 Five writers / illustrators and their families travelled to a town near Stuttgart to chat about their work, share their recently published books and eat together. 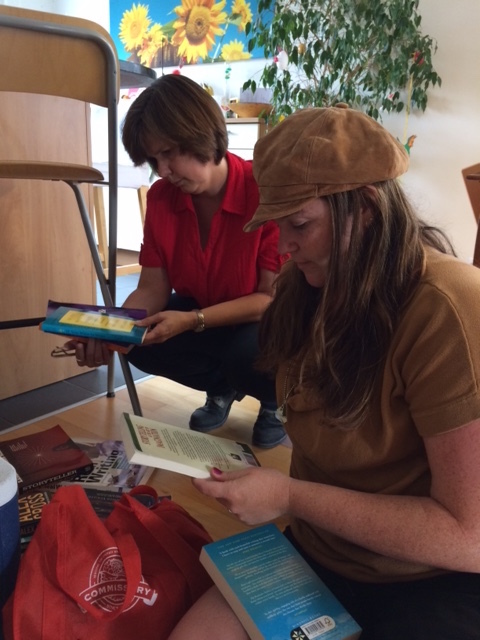 A book swap meant that children and adults also went home with new books to read. Top row: Linda, Angela, Sanne. Bottom row: Catherine, Twyla, Marcy. So, why did everybody make such a fantastic effort to travel (a long way in several cases!) to meet up? 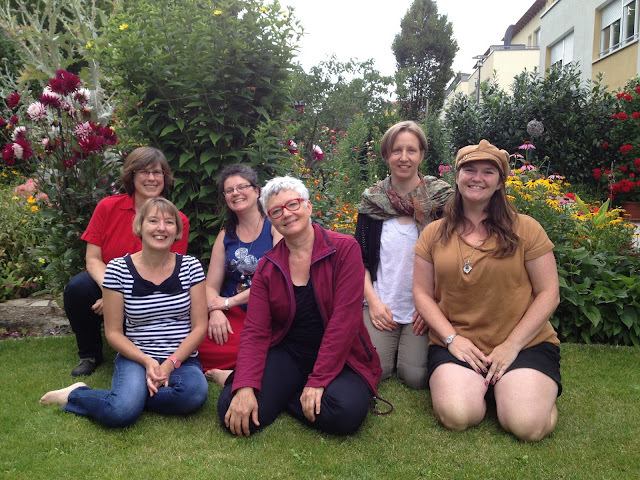 One of the reasons I love coming to our SCBWI Germany/Austria summer BBQ is because I live so far away from our other writers! Germany is big! But once a year I make sure to plan a six hour drive (round trip) to join up with some of our favourite writers and illustrators. It’s also a chance to include my family in my SCBWI world. Our children play together while we catch up, laugh a lot and have a connection moment with our artist selves. I love seeing these faces in real life and not just on Facebook. It’s like a family reunion but without the drama! Thank you for hosting such a beautiful day for our group, Catherine! It was wonderful to see everybody’s newly published books and to be the first to hear about new works before they are published. I’m always inspired and excited after spending time with my SCBWI family. How do we ex-pat writers and illustrators assuage our need for tribal contact, scattered as we are across southern Germany? 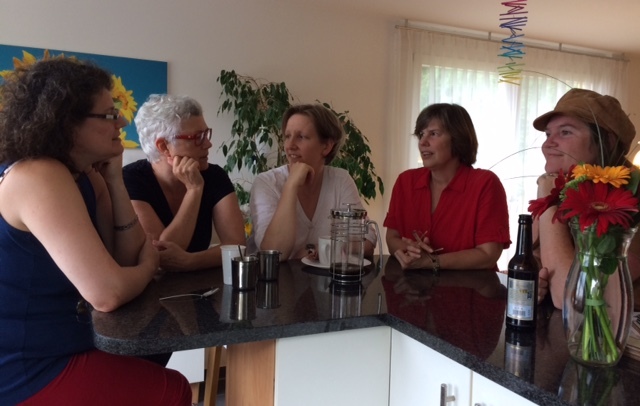 A summer’s afternoon BBQ and chance to catch up with fellow members of SCBWI Germany lured me willingly out of my creative cave and persuaded me to undertake the strenuous car-less trek from Munich to a small town outside Stuttgart on August 6th. Naively confident in my logistical planning, I ultimately arrived at Catherine Friess’ home almost in tears after a scary double-decker bus ride through steeply hilly country, two right and two wrong S-Bahn journeys and one more local bus ride before a short walk to the venue, a mere seven hours since leaving Munich…. And why am I going on and on about how hard it was for me to get there? Because giving up was never an option! 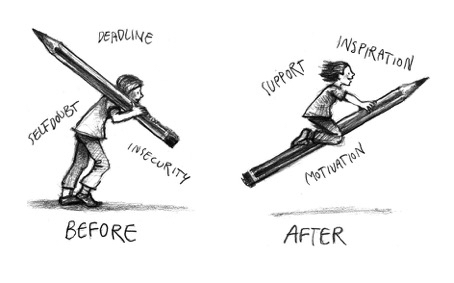 I need my SCBWI tribe. It is my hope that they need me too i.e. that I can be helpful in moving us all forward in our endeavours. The SCBWI summer BBQ is the perfect mix of work and play. 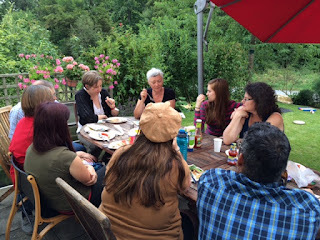 We can do all the things we normally do at meetings -share story ideas or works in progress, discuss literature and the writing life - but we also have time to connect on a personal level. Family members also come along and it's great to learn about everyone. Add in the book swap, good food, and lots of laughs and the day is perfect. I can't wait to do it again next year. 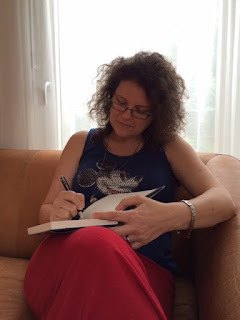 I welcome any opportunity I get to meet up with fellow writers and illustrators and our meetings always leave me with new enthusiasm for my writing. My husband and I really enjoyed hosting the BBQ this year and the atmosphere was both relaxed and inspiring. It was fantastic to look at members’ new books and hear the stories of how they came about, great to see the children choosing new books from the book swap and I very much appreciate the help that Twyla and Angela gave me with two of my picture books. 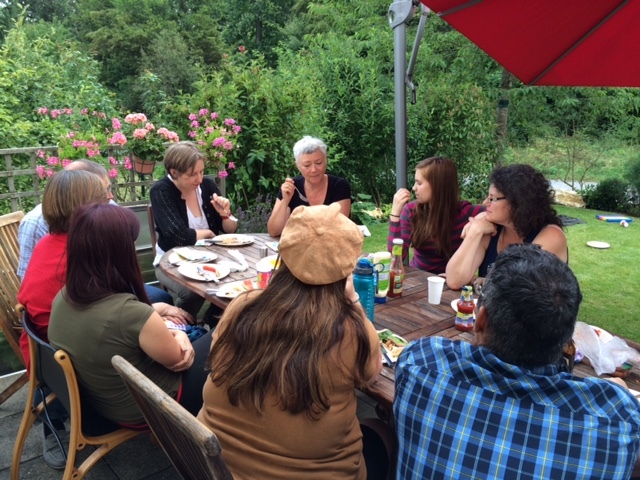 The SCBWI Germany / Austria BBQ is a great way to strengthen our creative and personal relationships with one another and the time that we spent together flew by far too quickly! Hopefully you will be able to join us at the BBQ next year!